for God has already approved what you do” (Eccl 9:7). 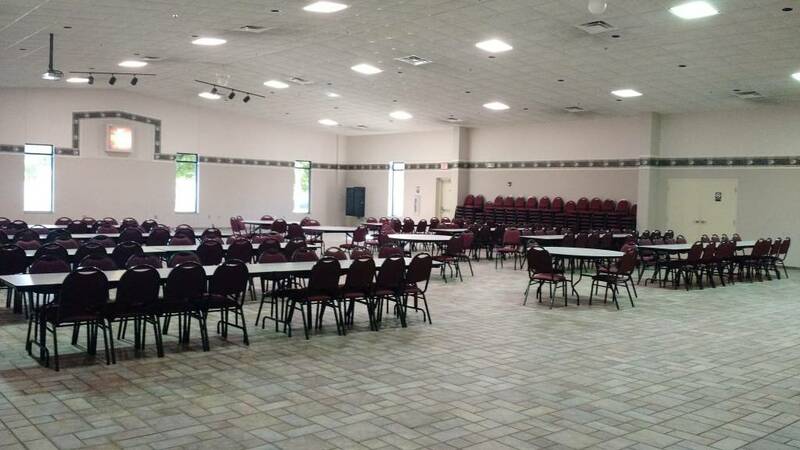 Blessed Mother Church is blessed to have one of the largest parish halls in the diocese. 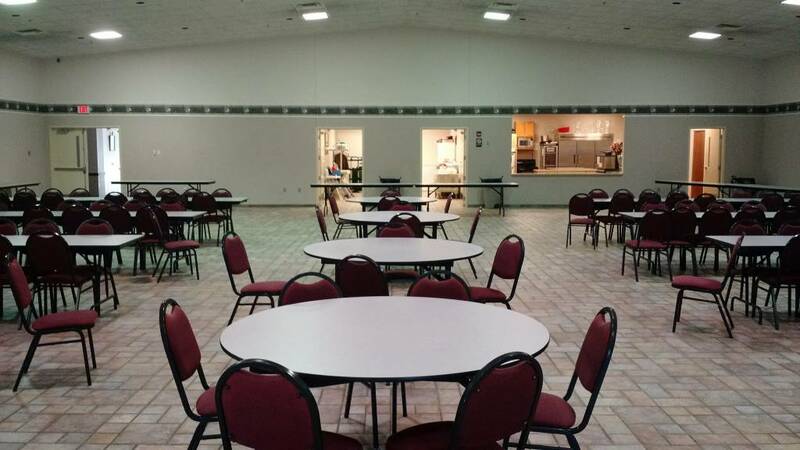 Our St. Joseph Hall, located in the Family Life Center next to the church, is often used for wedding receptions, dances, formal dinners, birthday parties, and other large gatherings. 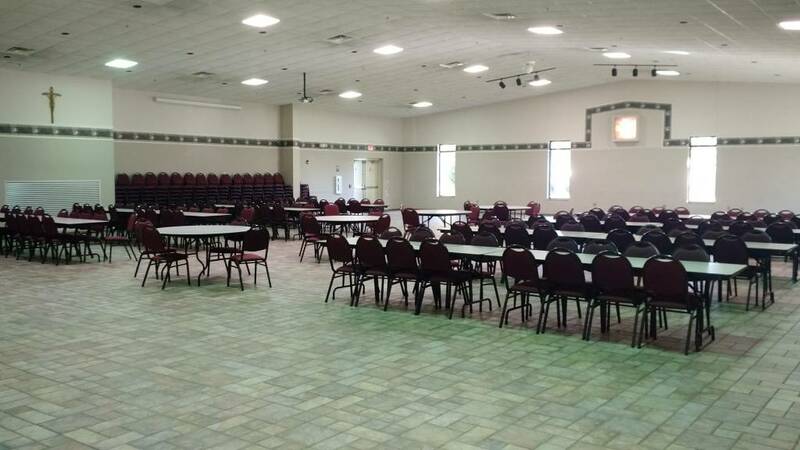 It can seat 400 people with tables and chairs, or 750 people with chairs only. There is also a large kitchen and prep area where food can be stored, cooked, and prepared for any occasion. The photos above don't really do it justice. Schedule a time to come see the hall for yourself! All reservations must be made with Mary Colburn. Time for preparation and decorating cannot conflict with any scheduled parish liturgy, function, or meeting. Please search for available dates under the "events" tab in the Parish Hall menu bar. All reservations are confirmed upon receipt of deposit, which is half of the rental fee. Should the rental party cancel 3 or more months prior to the confirmed date, the booking deposit will be returned in full. Should the rental party cancel within 3 months of the confirmed date, the booking deposit will not be returned. Your event must end by 1:00 AM. 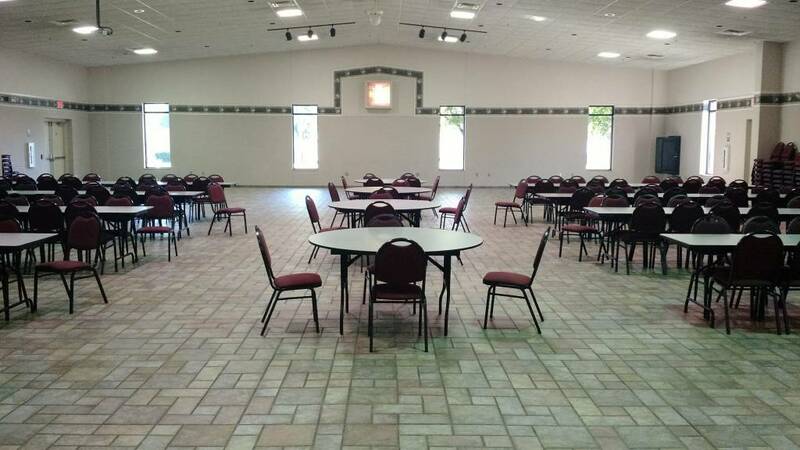 We also have small meeting rooms in the Family Life Center that can be reserved for a cost of $50. 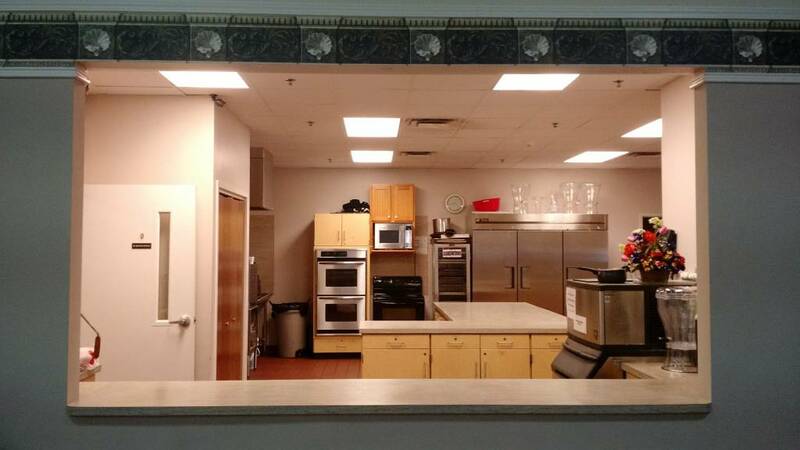 The cafeteria of the 4-6 Center can be reserved for a cost of $150. Both rooms must be cleaned after use. Other rates for small gatherings or gatherings with minimal time requested are available, with pricing subject to approval by the Pastor. Blessed Mother Church reserves the right to refuse lease with any person or group. Smoking or the use of tobacco products is prohibited inside the building. Please do not litter on the premises, inside or out, with debris from smoking or tobacco products. Containers for the disposal of these products are located outside of the building. Your lease covers the use of the interior of the Hall only. Exterior premises are to be used only for entering and leaving the facility. There should be no littering or defacing of the exterior of the facility. Lessee shall be responsible for any repair, replacement, or litter removal that results from violation of this regulation. Lessee is responsible for guest parking only in designated areas. Vehicles in violation may be towed at owner’s expense. No nails, thumbtacks, tape, or adhesives/fasteners may be used to fasten objects to the walls of the building. No birdseed, rice, or confetti may be used inside or outside of the building. If the kitchen area is used, any dishes, pots, pans, utensils, liners, dish cloths, etc. required for the event must be supplied by the lessee. No alcoholic beverages are to be served or consumed on the premises, inside or out, unless the alcohol liability insurance premium has been paid at least 3 weeks before your event occurs. If the alcohol liability insurance premium is paid, alcoholic beverages are permitted, if served and monitored by a bartender and if the use is limited to the inside of the hall. It shall be the lessee’s responsibility to comply with all local, state, and federal laws regarding the distribution and use of alcohol. The lessee is responsible for providing any alcoholic beverages for the event. “BYOB” is not allowed. The church will not be responsible for any items left on the premises. Advanced permission by the Pastor or the Parish Administrator is required for an item to be left on the premises after the event. Lessee and guests will not be a nuisance to or interfere with the rights, comfort, or convenience of the residents of the surrounding neighborhood or community. This includes not parking in front of their homes. Written consent from the Pastor or Parish Administrator is required for outdoor cooking/barbecues or games. The number of persons in attendance must not exceed the maximum legal capacity set by the State Fire Marshall. Unused chairs may not be stored in the table room in the hall. If chairs from the hall are moved to another area, they must be returned to the hall at the end of the event. Make sure all doors to the building are locked before leaving. Make sure all lights in the building (including bathroom lights) are turned off before leaving. This may sound like a lot, but, believe it or not, people reserve our hall all the time and they always manage to have a good time!